Texas A&M and TCU squared off in an NCAA Tournament super regional on Sunday night with a trip to the College World Series on the line. 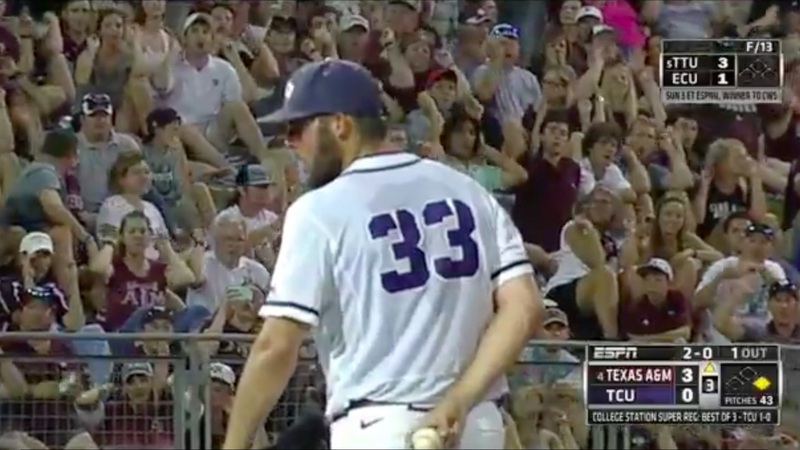 And with TCU already leading the best-of-three series 1-0, Aggie fans were not going to let their team go home quietly. In the top of the third inning, TCU junior Mitchell Traver issued a four-pitch walk. As a result, Texas A&M fans broke out the greatest chant in college baseball — one that doesn’t get nearly enough attention. It’s called "Ball Five." Nearly every fan in the stands began chanting those words ruthlessly, which proved to be effective. Traver threw another ball, which led to the crowd yelling "Ball six!" over and over. The next pitch? A ball. It went on as Traver threw seven straight balls before finally throwing a strike. Fans awarded him with an uproarious cheer and applause, sarcastically, of course. Unfortunately, it was to no avail as TCU went on to win 4-1 and advanced to Omaha.